When Shing Weddings contacted us to be a part of their Porcelain Blue Style File submission for Wedluxe Magazine we were immediately inspired to create something with color! Drawing upon the iconic Cobalt and White combination, we put our Sapphire, White Opal and Chalk White Swarovski Crystals to work! The shape of our signature marquise style also lent itself perfectly to the feathered motif. This set is now available by special order in our Online Shop and can be customized in other color combinations. 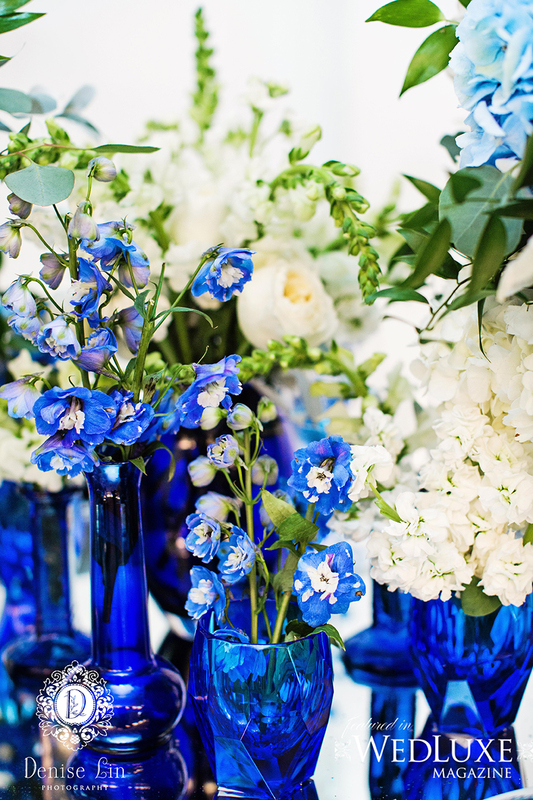 Don't you think it is the perfect Something Blue addition to your wedding day style? Also featured were our Stephanie Studs with a White Opal Cushion Cut Swarovski Crystal center. Statement studs are a great choice for your wedding day earrings or anytime really! The White Opal is a nice touch too with its milky glow. Many of our styles can be customized using this trending color or any color for that matter, just send us an email and we'll be happy to see if we can make that happen for you! PHOTOGRAPHY • Denise Lin Photography, CO-CONCEPT CREATOR, PLANNER, PLATES, CHAIR UPHOLSTERY AND BLUE CHAIR • Shing Weddings, CO-CONCEPT CREATOR, DECOR DESIGN, AND TABLE • Art of the Party Design, FLORAL DESIGN • The Flower Factory, STATIONERY DESIGN • Making Memories with Stationery, CAKE DESIGN • The Cake & The Giraffe, VENUE AND CHARGERS • Stanley Park Pavilion, HAIR STYLIST AND MAKEUP ARTIST • Anita Lee Beauty and Style, JEWELLERY • Elsa Corsi from Jeweliette, GOWN • Galia Lahav from Bisou Bridal, BLUE VASES • Atkinson's, GLASSWARE, FLATWARE, NAPKINS, AND WHITE CHAIR • A&B Partytime Rentals Ltd.